Rather than yarns you happen to create … whorls and more. I have had a number of questions in the Ravelry group about ratios and whorls* for spinning wheels. There are some really good resources out there to get started using and understanding ratios, some conversations more technical and others more basic. *Please note that ratios and whorls is used in this post interchangeably and mean the same thing: They are pulleys. That’s all. The larger the circumference, the lower/slower the ratio/whorl. The smaller the circumference, the higher/faster the ratio/whorl. A ratio on a spinning wheel is the relation between the number of times the flyer rotates around the bobbin to ONE revolution of the drive wheel. Sounds simple, right? It actually kind of is really simple. The trick is beginning to use those ratios to your advantage. Where do you start? I’ll share my story of where I started when I began using ratios, hopefully it will be helpful, and then please ask any questions you have in the comments below. This will help me to generate some more information for those wanting more information in a subsequent post! Above :: A standard flyer and whorl attached. Below :: Flyers with ratios built into them which sometimes provide slightly less choice but lessen the chances of loosing whorls! How do I know which ratio to choose on my spinning wheel when I want to spin a specific fibre? I start with a little research into the breed or fibre* that I am spinning. Let us say that I am spinning Polwarth. We will keep it simple to start and say that this is not a blend, but is a braid of 100% Polwarth. Upon some researching, I learn that the crimps per inch (CPI) on a Polwarth sheep are generally 8CPI; therefore, the ratio that I begin spinning at is 8:1. Matching the CPI to your twists per inch (TPI) will create a ‘balanced’ yarn based on matching the twists to crimps in the original fibre. In these early days of learning this theory, I pulled out a small ruler, plied a sample back on itself and counted TPI. I would highly encourage you to do the same! There are great tutorials out there on how to do that and I am in the process of creating one as well. *Remember than man-made fibres do not have any scales or crimp so fibres like nylon, Firestar or Angelina can take a lot of twist. Beware that while they can take a lot of twist, Firestar and Angelina in particular will eventually break. What’s the catch? There’s a huge catch. Most of us don’t place 8TPI in our yarn when we spin on a ratio of 8:1. Most of the time, we are drafting much faster than we are treadling so our drive wheel may be rotating 1-2 times for every 2, 3 … 6 inches of yarn. Some quick math means that there may be less than 1-2 twists per inch in that yarn rather than 8 because the twist is distributed over a much larger distance. One inch is not very long when compared to the yardage of a skein of yarn and to allow the drive wheel to complete ONE FULL revolution takes time. Here are some things to consider to help with this process! An example of a drive system (Double drive) with two whorl choices (small and large, currently being used by the white drive band on the right of the photo) to drive the drive wheel. In double drive, the drive band also applies the brake on the bobbin (the white band on the left of the photo), which is out of the scope of this post. Suffice to know that there are different drive systems but ALL use ratios! ETA (added at a later date for clarity): These examples are cited based on plied yarns and in the blog post, I’ve left my yarn as a SINGLES but wanting it to be balanced, I’ve spun to ~8TPI. The first thing to consider is the speed at which one is treadling. Treadling so fast that your wheel is levitating off the ground will definitely help to get some of that twist that your chosen ratio is producing into your yarn. But how do you measure that? What if you are a very, very, very slooooow treadler and barely move the drive wheel? Do you have too much twist entering your yarn because it is literally sitting in front of the wheel (ie. in your hands) for longer, rather than being sucked into the wheel at Mock 400? In both cases, it is difficult to determine whether your flyer is indeed rotating at 8 revolutions to 1 rotation of the drive wheel due to erratic or hap-hazard treadling. I will reference you here to a video I filmed about spinning and consistency using tape on your leg, which can be found here. Now that we are treadling consistently, in a default pattern, we can next begin to measure the number of twists entering our yarn per inch. Starting with simple short forward draft, pull an inch of yarn forward and wait for your feet to treadle one full revolution (ie. 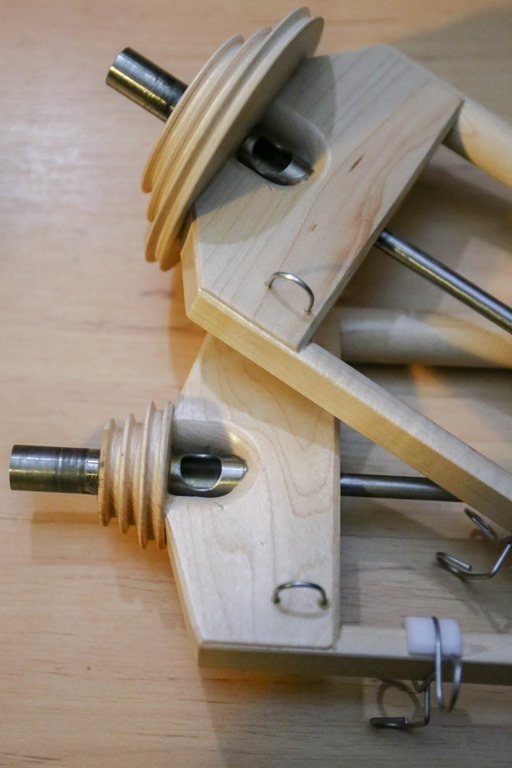 with double treadle wheels, both feet need to depress to create ONE revolution of your drive wheel but with single treadle, one foot only depresses once. Some prefer this and that is one reason why single treadle wheels remain popular!). Since we are currently spinning on a ratio of 8:1 (per the example we started with), we now have 8 twists in that ONE inch of singles. How cool is that? Using a high ratio to create the same effect over an inch of yarn will help you to begin to create yarns with matching twists and crimps per inch, and also learn how ratios work. 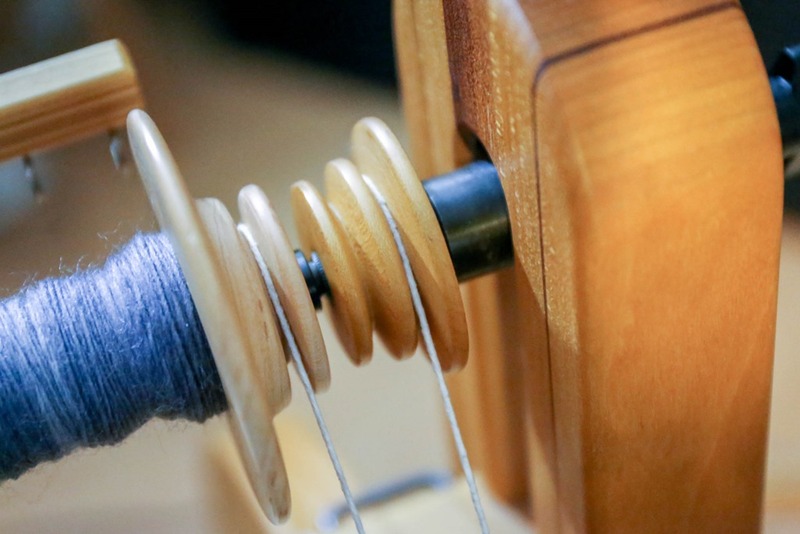 You may find you’ve been spinning yarns grossly under twist to crimp, or maybe the opposite! This is how I figured out the reason behind my ropey BFL! Does this mean every yarn we all spin from now on need to be spun with matching crimps and twists? NO! Please NO! Absolutely not! This is a place to start, to begin understanding ratios on your wheel and how they act in relation to the yarns you want to spin. Guess what you have to do now? Sample, sample, sample … sample … and then? sample some more! Maybe the Polwarth yarns you really like are spun at 10:1. Or maybe you really like BFL when it is spun at 5:1 (instead of 8:1, which is often recommended) because it prevents the ropey-ness that often comes with more tightly spun BFL. Maybe your Wensleydale is actually even lower than 2.5:1 and spinning it at 1:1 creates a nicer yarn to work with. Only you can figure that out but now you have some information to get started with, learn from and create the yarns you want to create, rather than yarns you happen to create. 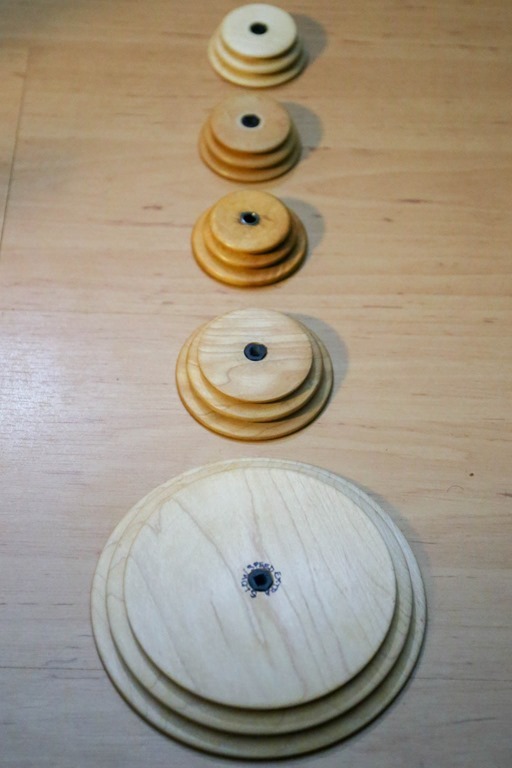 These whorls may all look the same at first glance, but they are actually all different and provide 6 different ratios for me to choose from when spinning. That’s a lot of choice! Consider using a permanent marker on the back to remind yourself of the ratios each one provides for quick reference. Write down your process: The ratio you used, how the uptake felt and your chosen draft (ie. short forward, long draw, from the fold, etc) because chances are you are going to create a yarn you want to re-create. If you don’t write it down, you’ll forget what you did and kick yourself! Please leave questions, comments and thoughts in the comments below! What did I miss that you’d like to know more about? How have ratios helped you in your spinning? Interesting post – and since you asked for questions… thinner yarns need more twist than thicker yarns – how does this CPI and TPI play into that equation? If you’re saying 8 TPI for polwarth, what weight is that yarn? Thanks for the question – thinner and thicker yarn depends on how far into your fibre supply you are reaching. You can still put 8 TPI into a thicker yarn or thinner yarn. The 8 TPI is a place to start. Let’s say you’re spinning sock yarn, then you may decide you want more like 10-12TPI and sampling is the way to figure that out. Thin yarns don’t necessarily have to have more twist – we’ve been conditioned to think that. You generally need more twist to hold fewer fibres together but sampling will tell you how much you actually need. I hope that helps! Thanks, Rachel for this discusiion on ratio. I am starting some corredalw so will give your suggestions a try. Thank you Carolyn. I hope it goes well. With Corriedale’s slightly longer staple, I love lower twist. It’ll be interesting to see what you like! That’s wonderful Sherri! I’m so glad you are having good results & learning from the content of there and here. Thank you, Rachel, for taking the time to write such an informative post. I appreciate so much your generosity in sharing your knowledge. I just wish I could take one of your classes and learn in person! What a thorough post! I’ve been spinning by feel for different fibers, I will often track twists per inch but never thought to align it with the crimps per inch of the fiber. That gives a whole new starting point for experimentation! Thank you for your post, Rachel. I have been spindle-spinning lately and hope to get back to wheel spinning. Thank you for helping me to better understand ratio/whorls and spinning “to the crimp.” I even got out my copy of The Intentional Spinner and saw that it has a crimp meter…so perhaps I will be using it to measure cpi! I look forward to any future post/s you have about this… Thank you for all that you share–both info and enthusiasm for spinning! Hi Rachel – my friends at Guild have listened to me droning on about falling down the CPI/TPI wormhole and I am completely fascinated by it. I’m currently working with Shetland fleece, spinning my home prepped raw fleece and commercial top. The commercial top behaves nicely at 8TPI and produces the right WPI as well – but the raw prepped fleece needs much more twist and even falls apart when pulled off the bobbin the twist back on itself to test the 2-ply count, even though I can hold the lock in my hand and count the crimps! Interested to see you give 8-12 as a count for this fibre and wonder if you know any reason for the wide variation? Haha I think you and I both have fallen down that wormhole! My friends think I’m crazy ;) Shetland is an interesting one due to the variation of fibre out there in this breed. I read that the sheep vary unbelievably and due to some being coated (guard hairs) versus not, that the fibre varies as well due to the coarseness and fineness in the variety of the breed. Shetland in and of itself is a fascinating sheep!!!! I’d love to hear more about your experience with it. Oh, so much lovely info from everyone! I’ve been spinning some with a drop spindle but can’t forget the feel of using a wheel. A friend of mine down here had one which she is going to loan me once she finishes the project she currently had on it. I picked up some Romney on clearance which is ready to go as well as some Shetland, BFL and Jacob which need to be combed first. I was thinking of blending some of it to play with. Any advice? Terrific post. I will check back often so that I can catch the next ‘installment’ of your blog! I would love to pose a question, but I’ve only been spinning about a year and a half. I don’t feel like I have enough experience to ask a question that would be of general interest. Thank you. Please don’t hesitate to ask, Barbara! Often spinning questions are great topics for the blog!! 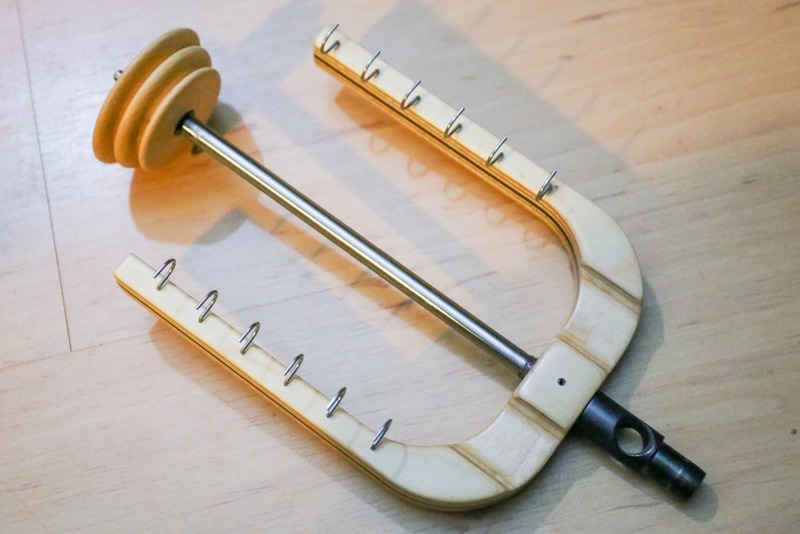 Do you know where to buy a whorl? I don’t have one and it would be great if I could, so that I can start spinning. It depends on the type of wheel you have — The Woolery might be a good place to start to help you? It depends on your specific spinning wheel — connecting with a large store like The Woollery might be a good place to start. Have you published a post that discusses double drive ratios? I recently bought a used double drive wheel and I am a complete newbie. I am still figuring it out through a LOT of trial and error. My wheel came with two different whorls, and I count myself lucky because the manufacturer only makes one size now. I am wondering if I am very limited and if I should look into setting up a hybrid double drive. I only have 5.5 and 4.7 ratio whorls. I know that it can be further adjusted with the tension, but I still feel like I don’t have much wiggle room. To be honest, I don’t do much with DD anymore as I don’t have a DD wheel anymore. I sold it due to space issues. The main thing about DD is that regardless of the ratio, it tends to be quite smooth and fast. Play around and see how you go. You can always manually count the rotations of the flyer during ONE revolution of the drive wheel to figure out your exact ratios and go from there. Hi, Rachel! Thank you so much for all your help! I understand the theory behind ratios/TPI/CPI, but what I wasn’t getting was that you have to use the smaller of the whorals (Kromski Minstrel) if you want anything to be taken up properly. I filled a whole bobbin before I realized what was/wasn’t happening. 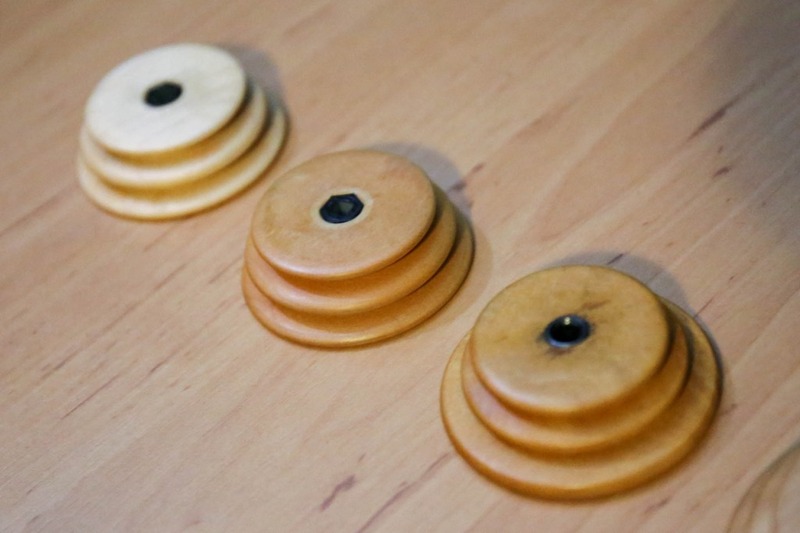 And the problem is, you can’t just turn your bobbin around. You get a mess. Everything else is a work-in-progress right now. The new wheel and very new wool samples are keeping me on my toes. Thank you very much again for all your time and consideration. I really appreciate it!!! You’re so welcome! Yes, you’re right that you can’t just turn your bobbins around!! It’s a nice thing to have a few spare bobbins in that case! Happy New Year, Rachel! I took your advice and got myself a few more bobbins AND a jumbo flier. Life’s good, but so much to do. LOL! I also joined my local Spinning & Weaving Guild and they’ve got me going right now. Smartest thing I’ve done yet. Hope all’s going well there! Keep warm and keep spinning & weaving! I love it! PS. And I bought myself a drum carder and am waiting for it to arrive. Can’t wait!! !